ictoria, the daughter of the duke of Kent and Princess Victoria of Saxe-Coburg, was born in 1819. She inherited the throne of Great Britain at the age of eighteen, upon the death of her uncle William IV in 1837, and reigned until 1901, bestowing her name upon her age. She married her mother's nephew, Albert (1819-1861), prince of Saxe-Coburg Gotha, in 1840, and until his death he remained the focal point of her life (she bore him nine children). Albert replaced Lord Melbourne, the Whig Prime Minister who had served her as her first personal and political tutor and instructor, as Victoria's chief advisor. Albert was moralistic, conscientious and progressive, if rather priggish, sanctimonious, and intellectually shallow, and with Victoria initiated various reforms and innovations— he organized the Great Exhibition of 1851, for example— which were responsible for a great deal of the popularity later enjoyed by the British monarchy. (In contrast to the Great Exhibition, housed in the Crystal Palace and viewed by proud Victorians as a monument to their own cultural and technological achievements, however, we may recall that the government over which Victoria and Albert presided had, in the midst of the potato famine of 1845, continued to permit the export of grain and cattle from Ireland to England while over a million Irish peasants starved to death). 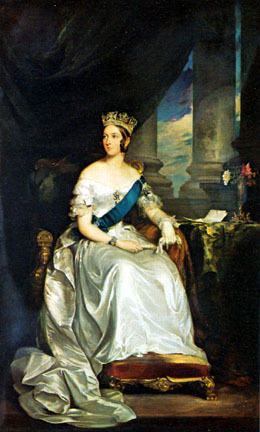 Sir Francis Grant's Portrait of Queen Victoria. You might wish to compare this image to others in the Victorian Web's Gallery of Portraits of Queen Victoria and the Royal Family. What do they suggest about the Queen's role in Victorian society? Her changing function as what the twentieth century terms a "role model"? After Albert's death in 1861 a desolate Victoria remained in self-imposed seclusion for ten years. Her genuine but obsessive mourning, which would occupy her for the rest of her life, played an important role in the evolution of what would become the Victorian mentality. Thereafter she lived at Windsor or Balmoral, travelling abroad once a year, but making few public appearances in Britain itself. Although she maintained a careful policy of official political neutrality, she did not get on at all well with Gladstone. Eventually, however, she succumbed to the flattery of Disraeli, and permitted him (in an act which was both symbolic and theatrical) to have her crowned Empress of India in 1876. (As Punch noted at the time, "one good turn deserves another," and Victoria reciprocated by making Disraeli Earl of Beaconsfield.) She tended as a rule to take an active dislike of British politicians who criticized the conduct of the conservative regimes of Europe, many of which were, after all, run by her relatives. By 1870 her popularity was at its lowest ebb (at the time the monarchy cost the nation £400,000 per annum, and many wondered whether the largely symbolic institution was worth the expense), but it increased steadily thereafter until her death. Her golden jubilee in 1887 was a grand national celebration, as was her diamond jubilee in 1897 (by then, employing the imperial "we," she had long been Kipling's "Widow of Windsor," mother of the Empire). She died, a venerable old lady, at Osborne on January 22, 1901, having reigned for sixty-four years. Roger Cullingham kindly notified us about his Royal Windsor site, which he's creating for Thamesweb.